The number of griffon vulture pairs in the Rhodope Mountains rewilding area in Bulgaria has now reached 95, paying testament to the efforts of the local rewilding team and partners. With the number of griffons in the Bulgarian and Greek sections of the Rhodope Mountains now totalling over 100 pairs, this magnificent yet locally endangered species continues its gradual reestablishment in the Balkans. The number of griffon vulture pairs in the Rhodope Mountains rewilding area in Bulgaria has now reached 95. Rewilding Europe is delighted to announce that the population of griffon vultures in the Rhodope Mountains rewilding area has grown since last year. Recent monitoring in the valley of the Arda River revealed a total of 95 pairs of the endangered species, representing one more pair than in 2018, and nine more pairs than in 2017. This is a testament to the hard work and dedication of the Rewilding Rhodopes team, and the ongoing activities carried out under the framework of the LIFE Vultures project. 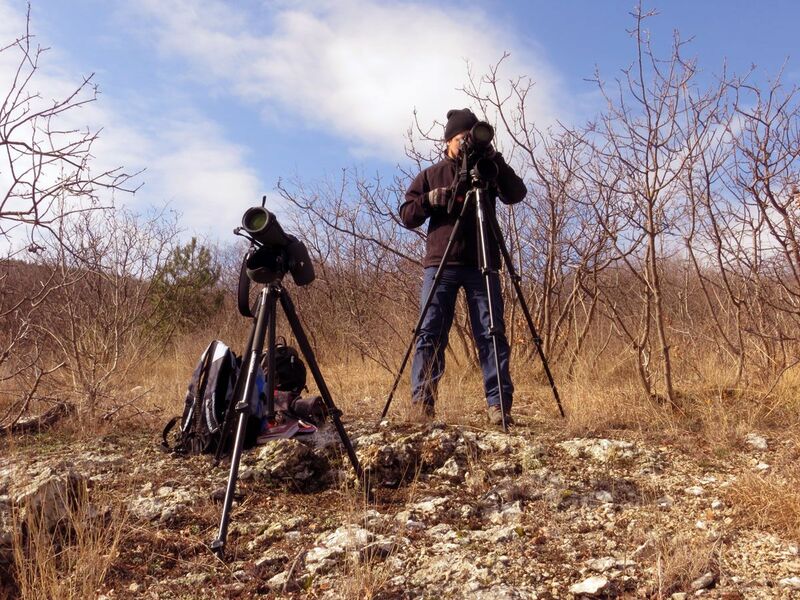 Volen Arkumarev, Conservation Officer, monitoring griffon vultures in the Bulgarian Rhodope Mountains. The griffon vulture was once widely distributed across Bulgaria. By the early 1970s, however – largely due to the decreasing availability of food, habitat loss, persecution and poisoning – it was thought to have disappeared completely. In 1986, a griffon vulture colony was discovered near the small town of Madjarovo in the Eastern Rhodope Mountains, consisting of about 20 birds and three nesting pairs. 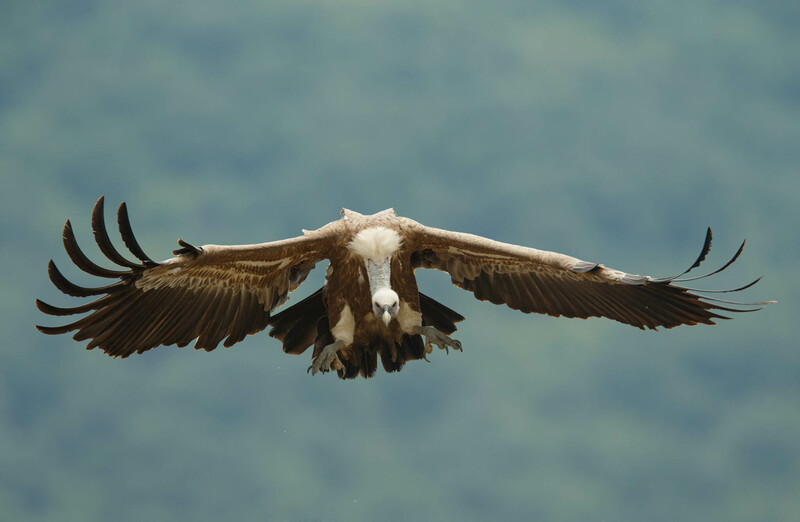 As a result of ongoing conservation efforts, it is from this low point that Bulgaria’s griffon vulture population continues its current comeback. Starting in 2016, the five-year LIFE Vultures project was developed by Rewilding Europe, in collaboration with the Rewilding Rhodopes Foundation, the Bulgarian Society for the Protection of Birds (BSPB), and a range of other partners. Focusing on the Rhodope Mountains rewilding area in Bulgaria, as well as a section of the Rhodope Mountains in northern Greece, the aim of the project is to support the recovery and further expansion of the black and griffon vulture populations in this part of the Balkans, mainly by improving natural prey availability, and by reducing mortality through factors such as poaching, poisoning and collisons with power lines. The number of griffon vultures in the Greek part of the Rhodope Mountains is also increasing. This year saw eight pairs recorded, taking the total number of Rhodopean griffons to over 100 pairs. Griffon vultures, like certain other bird species, remain with their partner for life. In the Rhodope Mountains rewilding area, most of the birds marked with GPS transmitters (as part of the LIFE Vultures project) have now occupied their nests. Typically a solitary egg is laid between January and April, which is then incubated for around 55 days. Sevt, a young Bulgarian griffon vulture, has constructed a nest for the first time in the Arda valley this year. Now six years old, he is finally ready to raise offspring. He was captured and ringed in Israel during his youthful wanderings, before returning to his native Eastern Rhodopes, where he was tagged with a GPS transmitter in 2017. With Sevt’s partner laying in early February, Sevt was entrusted to take care of the egg for four consecutive days last week. We wish Sevt and his partner well in the weeks ahead! Read more about the LIFE Vultures project here. Visit the Rewilding Rhodopes website here. Visit the Rewilding Rhodopes Facebook page here.